Note: This guide assumes that you already have an active Stripe account. You will need your Stripe Live Secret Key to create your Stripe data source. Note: If you do not see your API Keys, this means you don't have the right access permissions. You will need to get in touch with the administrator of your account for the API Keys, or request that they make you an administrator in the account's team settings. 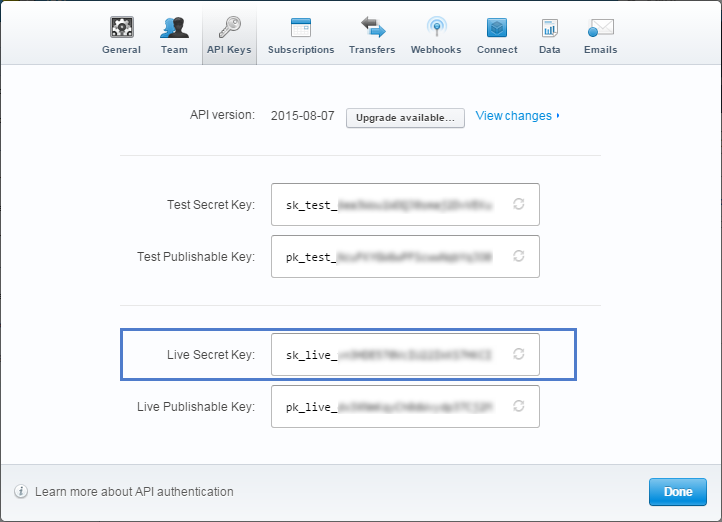 In Stripe, copy your Live Secret Key and paste it into Klipfolio. To create a data source using Stripe, go to the New Data Source page in Klipfolio and select the REST/URL connector option. Stripe offers a wide variety of queries. Refer to their API Docs for more options. This example limits the number of responses to 100. At Type, select Basic HTTP Authentication from the drop-down menu. At Username, enter your Stripe Live Secret Key.